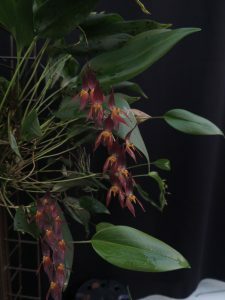 This stunning large flowered pleurothallis species is new to 365 days. The species is wet found in forests from Costa Rica to Ecuador where it grows in shade and is found over a wide range of elevation from warm forest at 350m to much cooler forest at 1750m. Individual flowers last several weeks and the plant produces a succession of flowers over several months so this plant will be a feature in the greenhouse well into the spring.